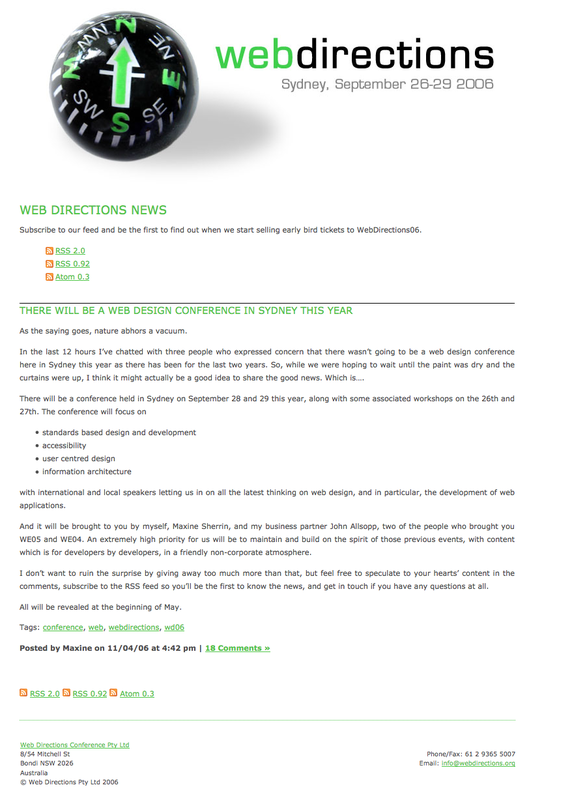 The earliest snapshot at the wayback machine for webdirections.org is from early 2006. April 13, 2006 to be precise. A simpler time. Some staples of the time include text rendered as an image (no doubt with some funky image replacement technique–ask your grandparents about those kids! ), links to multiple versions of RSS! Tiny text (text for some reason had to be tiny back then). I suspect Maxine and I whipped this one up over a couple of days. 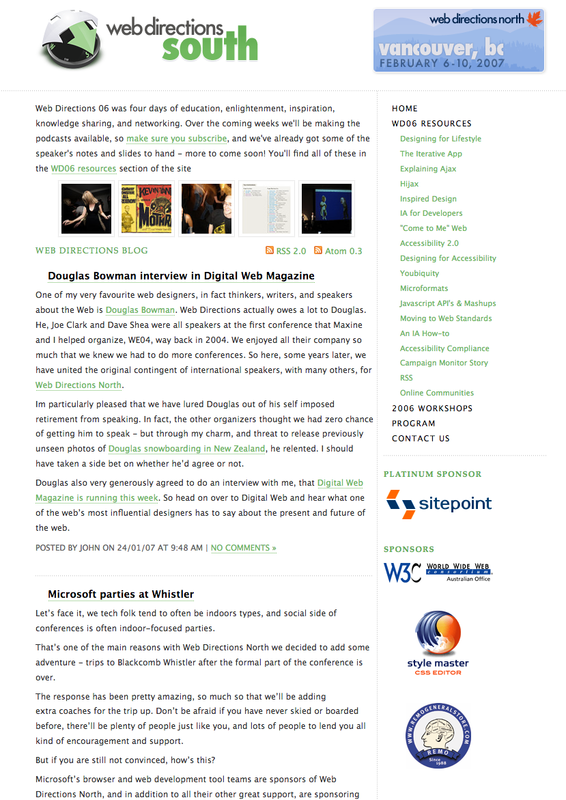 The site evolved through the coming year or so, even adding multiple columns, but the barebones style didn’t last long. 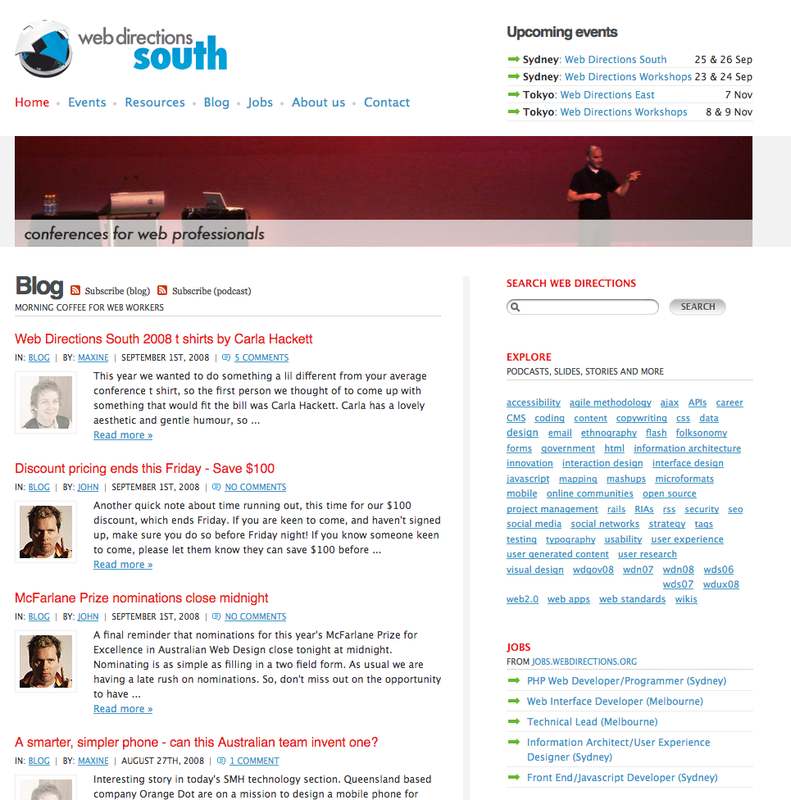 In 2007, Cam Adams (now at co-founder at Canva, who was instrumental on Google Wave, and who’s spoken at our conferences multiple times) built our first, event-focussed site for Web Directions South 2007. There were rounded corners! 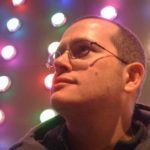 There were gradients (renowned designer Daniel Burka credits Cam for introducing gradients into Web Design). 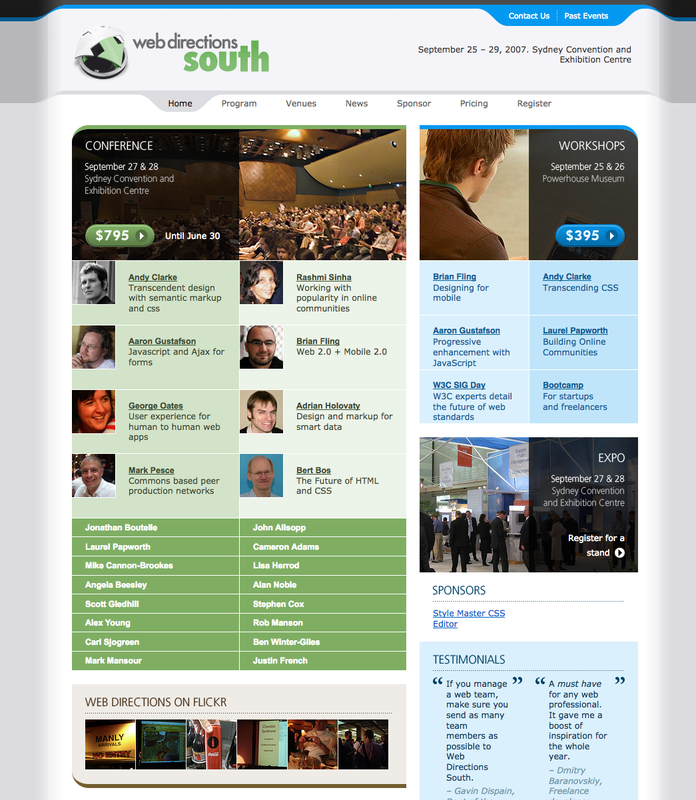 With the move toward multiple events a year (initially Web Directions North in Vancouver and Web Directions South in Sydney), we built what has it turns out been the foundation for our site ever since, designed and built by Ben Webster now founder of the successful insure tech company Insured By Us). Some time in 2015 or so we bumped up the font size a little, changed the typeface to Helvetica Neue (very stylish), and that’s about it. Which given we’re all about the Web is more than a little ironic. A big part of the reason for that is we’ve been working away on a complete overhaul for a long long time now. No screenshot needed as you are looking at it now! Art Directed and designed by Simon Wright (whose also responsible for the Art Direction of our event web sites) and built by the marvellous Mae De Leon it’s worth the wait we think. Perhaps it too will serve its a decade or more? Time will tell.